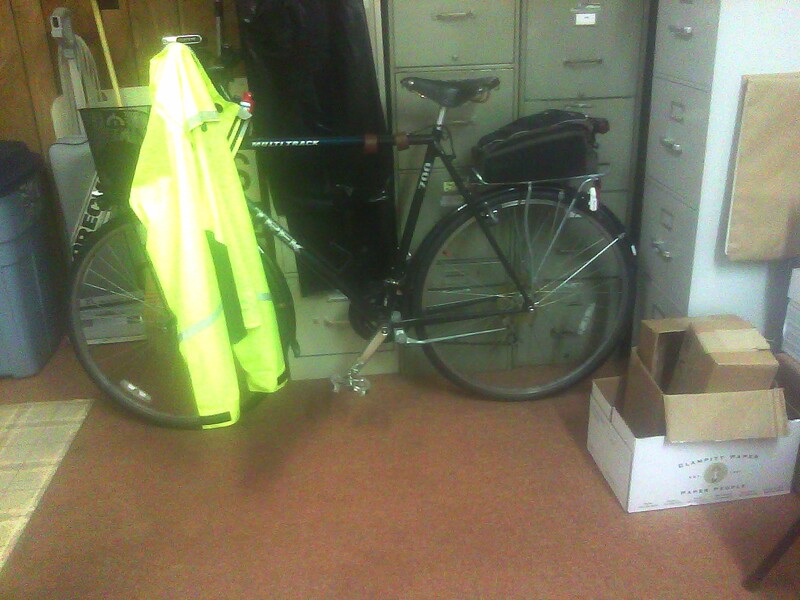 One of the "issues" some potential bike commuters use for not being bike commuters is where to secure the bike at work. If you look at some of the bike commuter web sites and commuter specific blogs www.bikecommuters.com cycledallas.blogspot.com dfwptp.blogspot.com www.commutebybike.com , you'll find lots of ideas and creative ways to manage this potential problem. I am fortunate to have access to a nice storage room, so the bike is out of the weather, waiting patiently for the end of the workday. My commuter bike, Kato and I look forward to the short ride home every day. If you've never tried bike commuting, give it a shot. You'll be more alert when you get to work, and have something to look forward to at the when the whistle blows!